While other big time football recruits were enjoying their break away from football or preparing for the next season, Ga’Quincy Mckinstry was leading his team to a state championship in basketball with some big plays, all while racking up basketball and football offers. McKinstry, also known as Kool-Aid, is a currently a sophomore at Pinson Valley High School and already holds two Division 1 basketball offers and 14 football offers. On the court he makes things happen with the ball in his hands, but on the field he has the ability to play both sides of the ball and be a weapon in the return game. 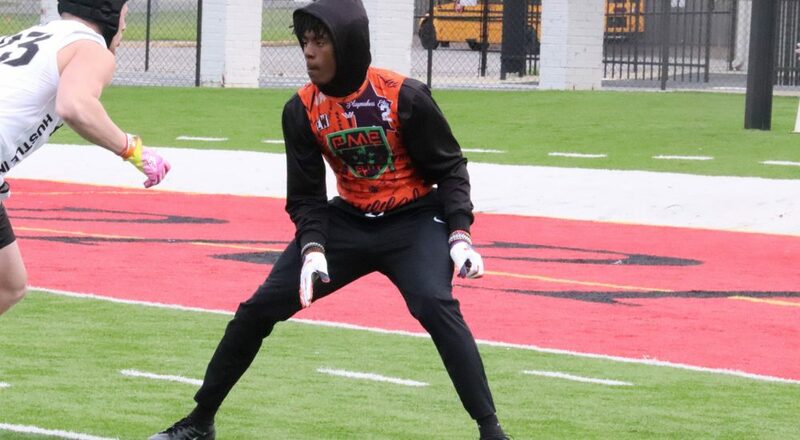 Touchdown Alabama Magazine got to see him in action at the Southern Express Border War 7-on-7 tournament on Saturday and he did not disappoint. He never left the field and brought his A-Game all day long as his squad dared opponents to stop him. Here are a few of the big plays McKinstry made. Alabama has extended an offer to McKinstry and are going to continue to recruit him very hard. He is expected to visit Alabama some time during the Spring.